Tired of short sales and beat up foreclosures? 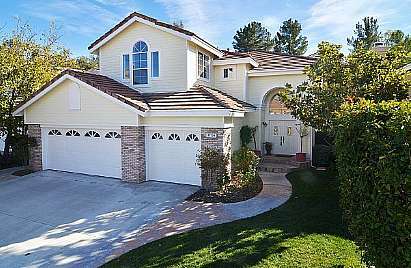 Then you must see this standard sale in one of Valencia's most desirable neighborhoods. This stunning remodel features 5 bedrooms and 3 baths (one bed and bath downstairs), large 3 car garage, and upgrades galore! One step through the front door and you'll see the new 20' tile floor and plush new carpet throughout, gorgeous wrought iron staircase, crown moulding, tall baseboards, and new door and window casing. The kitcen boasts refinished cabinetry, new stainless appliances, granite counter with breakfast bar, and new 9' deep cast iron sink. The family room boasts a new built-in and ceiling fan and opens up to the kitchen, creating the heart of the home. All bedrooms feature new ceiling fans and mirrored wardrobe doors, and the luxurious master bath has been remodeled with gorgeous tile and frameless shower glass. This home is completely turn key and waiting for you. But hurry, this is a STANDARD SALE and will go quickly!